Machine Learning Solutions | Free eBooks Download - EBOOKEE! Posted on 2018-05-18, updated at 2018-06-03, by perica123. Machine learning (ML) helps you find hidden insights from your data without the need for explicit programming. 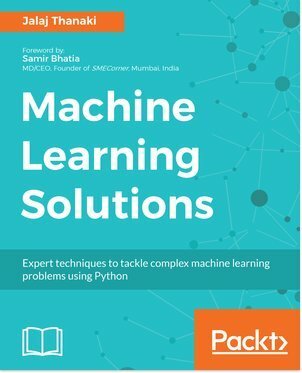 This book is your key to solving any kind of ML problem you might come across in your job. You'll encounter a set of simple to complex problems while building ML models, and you'll not only resolve these problems, but you'll also learn how to build projects based on each problem, with a practical approach and easy-to-follow examples. The book includes a wide range of applications: from analytics and NLP, to computer vision domains. Some of the applications you will be working on include stock price prediction, a recommendation engine, building a chat-bot, a facial expression recognition system, and many more. The problem examples we cover include identifying the right algorithm for your dataset and use cases, creating and labeling datasets, getting enough clean data to carry out processing, identifying outliers, overftting datasets, hyperparameter tuning, and more. Here, you'll also learn to make more timely and accurate predictions. In addition, you'll deal with more advanced use cases, such as building a gaming bot, building an extractive summarization tool for medical documents, and you'll also tackle the problems faced while building an ML model. By the end of this book, you'll be able to fine-tune your models as per your needs to deliver maximum productivity. No comments for "Machine Learning Solutions".